The Master of Orthopaedic & Trauma Surgery (MCh Orth) candidates were treated to two special visiting lecturers on 15 November, 2017. 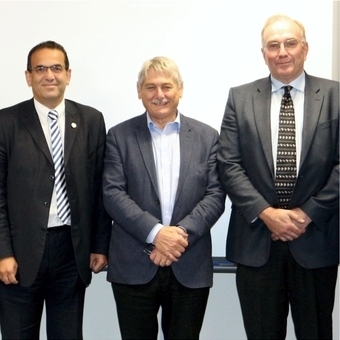 Distinguished visiting lecturers Professor Ian Trail and Professor John Stanley returned to the Department of Orthopaedic & Trauma Surgery to deliver their annual Upper Limb lectures. Candidates were treated to insights on Hand, Wrist & Elbow Arthroscopy and Arthroplasty by these two eminent consultant upper limb surgeons from Wrightington Hospital. Professors Trail and Stanley have been regular contributors on the MCh (Orth) course and enjoy the teaching environment and superb facilities at the TORT Centre so much that they give up their own valuable time every year to impart their vast orthopaedic knowledge to our postgraduate candidates. “There are no words that can describe my appreciation for the time, effort and ongoing support of John and Ian for their invaluable teaching on the MCh (Orth) Dundee course. Their selfless and generous enthusiasm in sharing their vast orthopaedic upper limb knowledge to our students is a highlight of the academic year for our students who gain so much from them. It is this continual high quality of our visiting Faculty that makes this course the ‘gold-standard’ for educating orthopaedic surgeons. It is always a pleasure to play a host for these distinguished surgeons, colleagues and friends”.